No, I’m not dead. I was just busy, busy, busy. Graduation hit, and my life went crazy. I’m still real job hunting, working, and riding. It’s way too hot to ride right now, but for some crazy reason, I’m still out there. My CoolMedics vest is saving my life. Except now it’s humid, so the vest doesn’t help. I hate monsoon season. Cuyamaca State Park is beautiful. I hadn’t been there in about 4 years, so the last time I saw it was pre-fire. It was sad to see all the damage that the fire caused, but amazing to see how fast things were regenerating, and how tough some of those old oak trees are to withstand the flames. Sunday morning, part of the trail went through the area of the park that hadn’t burned – wow! It was beautiful, but I was so glad I have a horse that is agile, pays attention to her feet, and is small. Parts of the trail were quite overgrown, so I’m thinking that in a sense, the fire might have been a good thing, as it cleared off a lot of the invasive underbrush from the other trails. Got to see and ride with Kaity again, for the first time in about a year and half. Mimi and Sonny took turns being Bad Pony on Saturday. I was really happy with the horsemanship performance Mimi allowed me to put in. 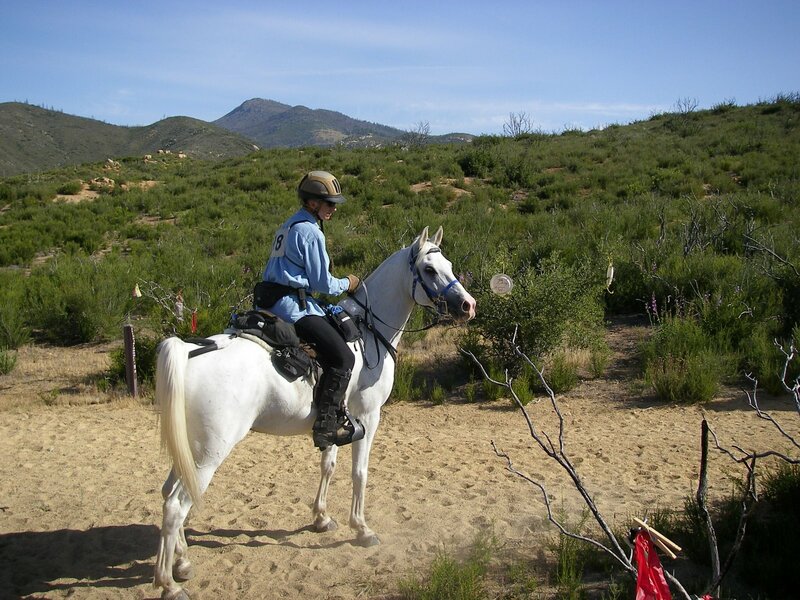 She was so well behaved for the obstacles, which included, in true CP fashion, an off-side mount, opening and closing a gate, a sidepass, and a downhill back, to name a few. I actually got 2nd place in horsemanship. Dad and Beamer, Saturday morning. Beamer’s 3rd NATRC ride, and it’s safe to say we have a competition horse. He really rearranged his brain in the 6 weeks between First of Spring and Descanso and he really has his head together now. HE only put in a couple little crowhops within the first 5 miles of the ride, when we were doing some power trotting on the fire road. Dad said it was fun. :) Crazy man. So what’s next for us? Still plugging away, even in the heat. Dad’s getting a new saddle, so after that happens, we’ll be able to pick up the training in earnest again. 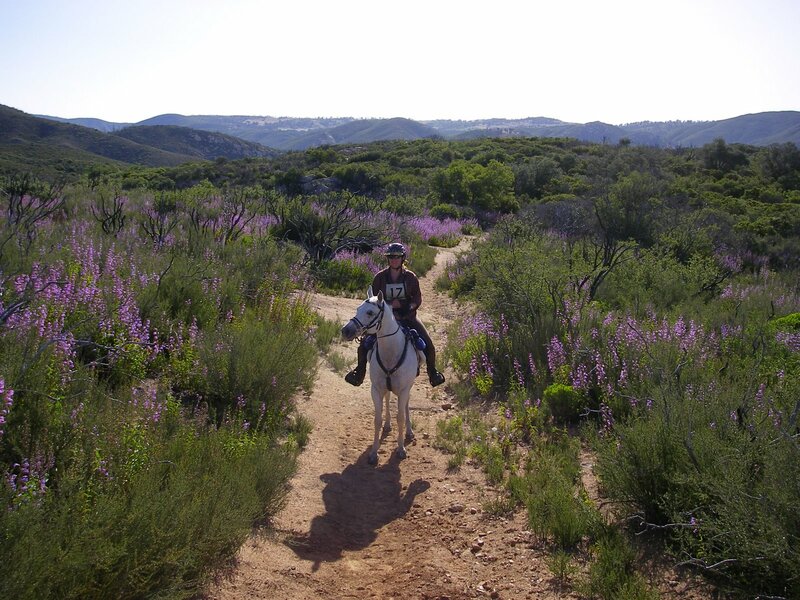 We’ll probably hit up Prescott and the Groom Creek area, where Michael and Julia Elias of Horses Dacor live. They’ve invited us to come up and ride with them some time. Precott = higher elevation = cooler temps. I’m in! Plus, I never pass up a chance to ride with experience endurance riders. Helps give me a better sense of speed and timing as well. I’m planning a 3 day overnight camping trip over Labor Day weekend up to Flagstaff and Little Elden Springs Horse Camp, one of AZ’s premier horse camps. Better call and make reservations now. There are over 200 miles of trails that base out of that camp, so I think it’s safe to say that will be a good training weekend. Man vs. Horse in October is our next ride, and we’re probably just going to do the 25. Had to put Bryce Canyon on hold, unfortunately. Maybe next year… But I love M v. H! It was my first AERC ride, and it’s a total blast! Not to mention, the runner stations are very generous and let you pig out on junk food they supply for the runners. After that, who knows? I’d ideally like to hit up Paso Del Norte and do the 50 there…it’s 3 weeks after M v. H.
I’d love to do Death Valley this year, too! Dad probably won’t join me on that adventure…I don’t think I’ve managed to corrupt him into being that extreme yet. So I either need to have my own hauling vehicle by then, or bum a ride from someone. My goal is to have my 300 Tevis qualifying miles ideally by March. Some of my thoughts about Tevis, and why I truly do think I can do it with only a year of 50s under my belt. Despite what Indiana Jones says, in this case it is the years, not the miles. I’ve owned Mimi for going on 11 years. She and I have done everything together, short of carting and 3 day eventing. While I don’t have that many competition miles, I have been training, conditioning and competing for the last 6 years. I condition a lot more than I compete. Naturally, the idea of doing Tevis revolves around the ability to complete 50s, since we haven’t yet managed to get on one of those…*grin*. But Mimi’s not called the go-pony for nothing, so Tevis 2008, here we come!